The CTI server configuration options can be found in the web-interface under the services tab. The general options allow the administrator to manage network connections between the CTI server and the clients. The section named STARTTLS options allows the administrator to enable encrypted communications between the clients and xivo-ctid and specify the certificate and private keys to use. If no certificate and private key is configured, xivo-ctid will use the ones located in /usr/share/xivo-certs. Parting options are used to isolate XiVO users from each other. These options should be used when using the same XiVO for different enterprises. Context separation is based on the user’s line context. A user with no line is not the member of any context and will not be able to do anything with the CTI client. xivo-dird must be restarted to take into account this parameter. 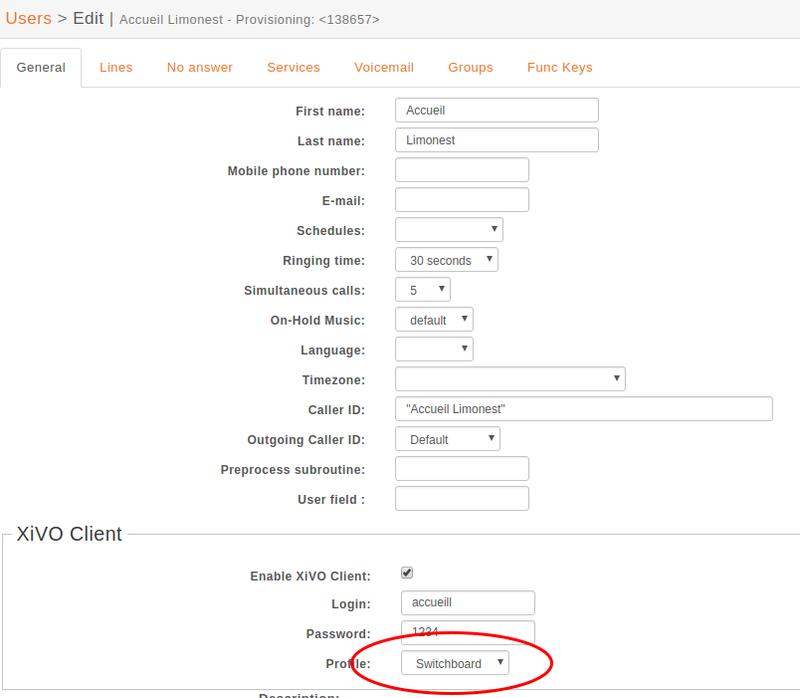 where backend name is the name of an enabled xivo-auth Backends Plugins. In the Status menu, under Presences , you can edit presences group. The default presence group is francais . When editing a group, you will see a list of presences and their descriptions. To use another presence group, you can edit the CTI profile you are using and select the appropriate presence group for that profile. In your XiVO Client, in the menu XiVO Client ‣ Configure ‣ Connection, click on the lock icon. A client which chooses to use encryption will not be able to connect to a server that does not have STARTTLS enabled. For now, there is no mechanism for strong authentication of the server. The connection is encrypted, but the identity of the server is not verified. To choose which features are available to users using a profile, you have to select which Xlets will be available. Floating means that the frame can be detached from the main window of the CTI Client. Scroll means that the Xlet will display a scroll bar if the Xlet is too large. grid will display a Xlet inside the main window, and it will not be movable. Multiple grid Xlets will be laid out vertically (the second below the first). tab will display a Xlet inside a tab of the Xlet Tabber. Thus the Xlet Tabber is required and can’t be in a tab position. The Number attribute gives the order of the Xlets, beginning with 0. The order applies only to Xlets having the same Position attribute.